Greetings from on the road! Technology can be a blessing...when all the stars are aligned (translation: your wifi works). And a curse when it fails! If this post is up by Monday then you'll know I did the happy dance! This week at Tammy's Scrapin corner we are creating with animals. 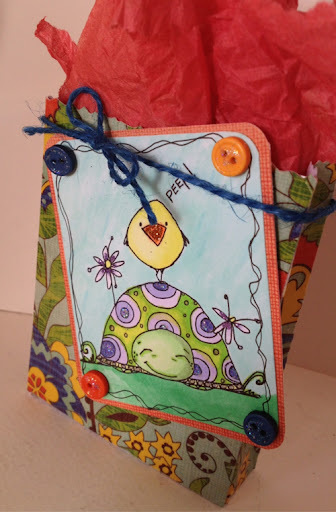 This cute little bag is made with the Tim Holtz Sizzix treat bag Die. The front was decorated with an image from Just Some Lines called Turt and Peep. Too cute. Come on over and link it up are 2 Creative Chicks 3D Challenge. Thank you so much for Doing such a wonderful Creation for our Sponsor this week.